Lycopene is a bright red, fat-soluble carotenoid pigment and phytochemical, C40H56, found in tomatoes, watermelon, guava, and other red fruits. Structurally, it is a tetraterpene assembled from eight isoprene units, composed entirely of carbon and hydrogen, and it is insoluble in water. For plants, algae, and other photosynthetic organisms that synthesize this pigment, lycopene is an important intermediate in the biosynthesis of many carotenoids, including beta carotene, responsible for yellow, orange, or red pigmentation, photosynthesis, and photo-protection. For humans, while they do not produce lycopene, it is available through the diet and transported in the blood by lipoproteins to be deposited widely in various organs and body tissues (liver, prostate gland, adrenal gland, testes, skin, and so on). While it is not an essential nutrient, it is considered to have a variety of health benefits. Lycopene's eleven conjugated double bonds, which give it its deep red color, are responsible for its antioxidant activity. The main source for humans is tomatoes and tomato products (tomato sauce, ketchup, soup, juice, and so on). Due to its strong color and non-toxicity, lycopene also is a useful food coloring. Because preliminary research has shown an inverse correlation between consumption of tomatoes and cancer risk, lycopene has been considered a potential agent for prevention of some types of cancers, particularly prostate cancer. However, this area of research and the relationship with prostate cancer have been deemed insufficient of evidence for health claim approval by the United States Food and Drug Administration (see below under Antioxidant properties and potential health benefits). Lycopene belongs to the family of pigments called carotenoids. Carotenoids are terpenoids, structured in the form of a polyene chain, widely distributed in nature, and commonly imparting yellow, orange, red, or purple colors. Generally, they are fat-soluble, dissolving in fats and oils but not water, except when complexed with proteins. In plants, they naturally occur in chromoplasts, imparting color to fruits and vegetables. Animals obtain carotenoids through the diet. For example, the pink color of flamingos and salmon are due to carotenoids obtained through the diet. Lycopene is a symmetrical tetraterpene assembled from 8 five-carbon isoprene units. Because it consists entirely of carbon and hydrogen, is also a carotene, a class of related organic compounds with the formula C40H56 (Grossman et al. 2004). Carotenes exist in several isomers that have the same formula but different molecular structures. Isolation procedures for lycopene were first reported in 1910, and the structure of the molecule was determined by 1931. In its natural, all-trans form, the molecule is long and straight, constrained by its system of eleven conjugated double bonds. Each double bond in this extended π electron system reduces the energy required for electrons to transition to higher energy states, allowing the molecule to absorb visible light of progressively longer wavelengths. Lycopene absorbs all but the longest wavelengths of visible light, so it appears red (Rao et al. 2007). 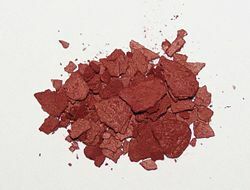 Lycopene, here dissolved in dichloromethane, is an intense bright red pigment. Plants and photosynthetic bacteria naturally produce all-trans lycopene, but a total of 72 geometric isomers of the molecule are sterically possible. (A total of 1054 isomers are theoretically possible, but only 72 are possible due to steric hindrance). When exposed to light or heat, lycopene can undergo isomerization to any of a number of these cis-isomers, which have a bent rather than linear shape. Different isomeres were shown to have different stabilities due to their molecular energy (highest stability: 5-cis ≥ all-trans ≥ 9-cis ≥ 13-cis > 15-cis > 7-cis > 11-cis: lowest) (Chasse et al. 2001). In the human bloodstream, various cis-isomers constitute more than 60% of the total lycopene concentration, but the biological effects of individual isomers have not been investigated (Rao et al. 2003). Lycopene is insoluble in water and can be dissolved only in organic solvents and oils. Because of its non-polarity, lycopene in food preparations will stain any sufficiently porous material, including most plastics. While a tomato stain can be fairly easily removed from fabric (provided the stain is fresh), lycopene diffuses into plastic, making it impossible to remove with hot water or detergent. If lycopene is oxidized (for example, by reacting with bleaches or acids), the double bonds between the carbon atoms will be broken; cleaving the molecule, breaking the conjugated double bond system, and eliminating the chromophore. The name lycopene is derived from the tomato's species classification, Solanum lycopersicum where lyco is Greek for "wolf," and persicum means "peach," and thus meaning "wolf-peach." 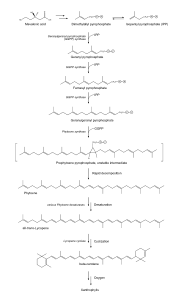 The biosynthesis of lycopene in eukaryotic plants and in prokaryotic cyanobacteria is similar, as are the enzymes involved (Cunningham 2007). Synthesis begins with mevalonic acid, which is converted into dimethylallyl pyrophosphate. This is then condensed with three molecules of isopentenyl pyrophosphate (an isomer of dimethylallyl pyrophosphate), to give the twenty carbon geranylgeranyl pyrophosphate. Two molecules of this product are then condensed in a tail-to-tail configuration to give the forty carbon phytoene, the first committed step in carotenoid biosynthesis. Through several desaturation steps, phytoene is converted into lycopene. The two terminal isoprene groups of lycopene can be cyclized to produce beta carotene, which can then be transformed into a wide variety of xanthophylls (Armstrong 1996, p. 229). Dietary sources of lycopene (Rao and Rao 2007, pp. 209–210). Fruits and vegetables that are high in lycopene include gac, tomatoes, watermelon, pink grapefruit, pink guava, papaya, red bell pepper, seabuckthorn, wolfberry (goji, a berry relative of tomato), and rosehip. Although gac (Momordica cochinchinensis Spreng) has the highest content of lycopene of any known fruit or vegetable, up to 70 times more than tomatoes for example, due to gac's rarity outside its native region of Southeast Asia, tomatoes and tomato based sauces, juices, and ketchup account for more than 85 percent of the dietary intake of lycopene for most people (Rao 2007). The lycopene content of tomatoes depends on species and increases as the fruit ripens (Khan et al. 2008, p. 495). Cooking and crushing tomatoes (as in the canning process) and serving in oil-rich dishes (such as spaghetti sauce or pizza) greatly increases assimilation from the digestive tract into the bloodstream. Lycopene is fat-soluble, so the oil is said to help absorption. Lycopene may be obtained from vegetables and fruits such as the tomato, but another source of lycopene is the fungus Blakeslea trispora. Gac is a promising commercial source of lycopene for the purposes of extraction and purification. After ingestion, lycopene is incorporated into lipid micelles in the small intestine. These micelles are formed from dietary fats and bile acids, and help to solubilize the hydrophobic lycopene and allow it to permeate the intestinal mucosal cells by a passive transport mechanism. Little is known about the liver metabolism of lycopene, but like other carotenoids, lycopene is incorporated into chylomicrons and released into the lymphatic system. In blood plasma, lycopene is eventually distributed into the very low and low density lipoprotein fractions (Stahl 1996, p. 6). Lycopene is mainly distributed to fatty tissues and organs such as the adrenal glands, liver, lungs, prostate gland, colon, skin, and testes (Slomski and Norris 2005)..
Lycopene is non-toxic and is commonly found in the diet, but cases of excessive carotenoid intake have been reported. In a middle aged woman who had prolonged and excessive consumption of tomato juice, her skin and liver were colored orange-yellow and had elevated levels of lycopene in her blood. After three weeks on a lycopene-free diet her skin color returned to normal (Stahl 1996, p. 6). Lycopenemia is the name of the medical condition resulting from a high concentration of lycopene in the blood and the orange-yellow pigmentation of the skin. Lycopene may be the most powerful carotenoid quencher of singlet oxygen (Di Mascio 1989, pp. 532–538), being 100 times more efficient in test tube studies of singlet-oxygen quenching action than vitamin E, which in turn has 125 times the quenching action of glutathione (water soluble). Singlet oxygen produced during exposure to ultraviolet light is a primary cause of skin aging (Berneburg 1999, pp. 15345–15349). As a strong antioxident, lycopene is considered to fight free radicals, the highly reactive molecules that attack DNA, damage cell membranes, and create disease (Slmoski and Norris 2005). Given its antioxidant properties, substantial scientific and clinical research has been devoted to a possible correlation between lycopene consumption and general health. Early research suggested some amelioration (combating of) of cardiovascular disease, cancer, diabetes, osteoporosis, age-related macular degeneration, and even male infertility (Giovannucci 1995, pp. 1767–76; Slmoski and Norris 2005). As an antioxidant, it is believed to prevent the oxidation of low-density liproprotein (LDH), the "bad cholesterol" that has a role in cardiovascular disease, and a relationship has been shown between a lycopene rich diet and reduced risk of cancers of the prostate and pancreas (Slmoski and Norris, 2005). In several studies, lycopene was the only carotenoid associated with risk reduction of these cancers, and one study showed a reduced risk of prostate cancer up to 34 percent associated with consuming tomato products twice a week as opposed to not at al (Slmoski and Norris 2005). Lycopene was the only micronutrient where the blood serum level was inversely correlated with the risk of age-related macular degeneration (Slmoski and Norris 2005). The related carotenoid antioxidant, beta-carotene, has been shown to increase the number of prostate cancer cases in a subset of patients (AACR 2007), although this area of research remains controversial and ongoing. ↑ IARC Handbook (1998), 25. American Association for Cancer Research (AACR). 2007. No magic tomato? Study breaks link between lycopene and prostate cancer prevention. Science Daily May 17, 2007. Retrieved January 10, 2009. Armstrong, G. A., and J. E. Hearst. 1996. Carotenoids 2: Genetics and molecular biology of carotenoid pigment biosynthesis. FASEB J. 10(2): 228–37. PMID 8641556. Retrieved January 9, 2009. Basu, A., and V. Imrhan. 2007. Tomatoes versus lycopene in oxidative stress and carcinogenesis: Conclusions from clinical trials. Eur J Clin Nutr 61(3): 295–303. PMID 16929242. Retrieved January 10, 2009. Berneburg, M., S. Grether-Beck, V. Kurten, T. Ruzicka, K. Briviba, H. Sies, and J. Krutmann. 1999. Singlet oxygen mediates the UVA-induced generation of the photoaging-associated mitochondrial common deletion. Journal of Biological Chemistry 274(22): 15345–15349. PMID 10336420. Retrieved January 10, 2009. Britton, G., S. Liaaen-Jensen, and H. Pfande. 1996. Carotenoids: Synthesis. Boston: Birkhauser. ISBN 3764352973. Chasse, G. A., M. L. Mak, E. Deretey, et al. 2001. An ab initio computational study on selected lycopene isomers. Journal of Molecular Structure: THEOCHEM 571(1): 27-37. Retrieved January 10, 2009. Cunningham, F. X., H. Lee, and E. Gantt. 2007. Carotenoid biosynthesis in the primitive red alga Cyanidioschyzon merolae. Eukaryotic Cell 6(3): 533–45. PMID 17085635. Retrieved January 10, 2009. Di Mascio, P., S. Kaiser, and H. Sies. 1989. Lycopene as the most efficient biological carotenoid singlet oxygen quencher. Arch. Biochem. Biophys. 274(2): 532–8. PMID 2802626. Retrieved January 10, 2009. Food and Drug Administration (FDA), United States. 2005. Qualified health claims: Letter regarding tomatoes and prostate cancer (Lycopene Heath Claim Coalition). US Food and Drug Administration Docket No. 2004Q-0201. Retrieved January 10, 2009. Gerster, H. 1997. [http://www.ncbi.nlm.nih.gov/pubmed/9100211 Potential role of lycopene for human health}. J Am Coll Nutr 16(2): 109–26. PMID 9100211. Retrieved January 10, 2009. Giovannucci, E., A. Ascherio, E. B. Rimm, M. J. Stampfer, G. A. Colditz, and W. C. Willett. 1995. Intake of carotenoids and retinol in relation to risk of prostate cancer. J. Natl. Cancer Inst. 87(23): 1767–76. PMID 7473833. Retrieved January 10, 2009. Grossman, A. R., M. Lohr, and C. S. Im. 2004. Chlamydomonas reinhardtii in the landscape of pigments. Annu. Rev. Genet. 38: 119–73. PMID 15568974. Retrieved January 10, 2009. IARC Working Group on the Evaluation of Cancer Preventive Agents. 1998. IARC Handbooks of Cancer Prevention: Volume 2: Carotenoids (IARC Handbooks of Cancer Prevention). Oxford University Press. ISBN 9283230027. Khan, N., F. Afaq, and H. Mukhtar. 2008. Cancer chemoprevention through dietary antioxidants: Progress and promise. Antioxid. Redox Signal. 10(3): 475–510. PMID 18154485. Retrieved January 10, 2009. Rao, A. V., and L. G. Rao. 2007. Carotenoids and human health. Pharmacol. Res. 55(3): 207–16. PMID 17349800. Retrieved January 10, 2009. Rao, L. G., E. Guns, and A. V. Rao. 2003. Lycopene: Its role in human health and disease. AGROFood Industry Hi-tech July/August 2003. Retrieved January 10, 2009. Slomski, G., and T. Norris. 2005. In J. L. Longe, The Gale Encyclopedia of Alternative Medicine. Farmington Hills, MI: Thomson/Gale. ISBN 0787693960. Stahl, W., and H. Sies. 1996. Lycopene: A biologically important carotenoid for humans? Arch. Biochem. Biophys. 336(1): 1–9. PMID 8951028. Retrieved January 10, 2009. This page was last modified on 4 August 2018, at 16:16.